More than 100 people gathered at the Spencer M. Patrich Auditorium at Wayne State University Law School on Thursday Sept. 17 to celebrate the publication of "The People’s Lawyer: The Life and Times of Frank J. Kelley, the Nation’s Longest-Serving Attorney General." The book was authored by Frank Kelley and Area Head of Journalism Faculty at Wayne State University Jack Lessenberry. Known as the "eternal general," Kelley was Michigan’s 50th attorney general and served for 37 years (1961-1999), giving him the distinction of being both the youngest (36 years old) and oldest (74 years old) attorney general in the state’s history. Kelley is also credited with establishing both the consumer protection and environmental protection divisions in the state of Michigan; he was the first state attorney general in the nation to do so. He still holds the record for longest-serving attorney general in U.S. history. 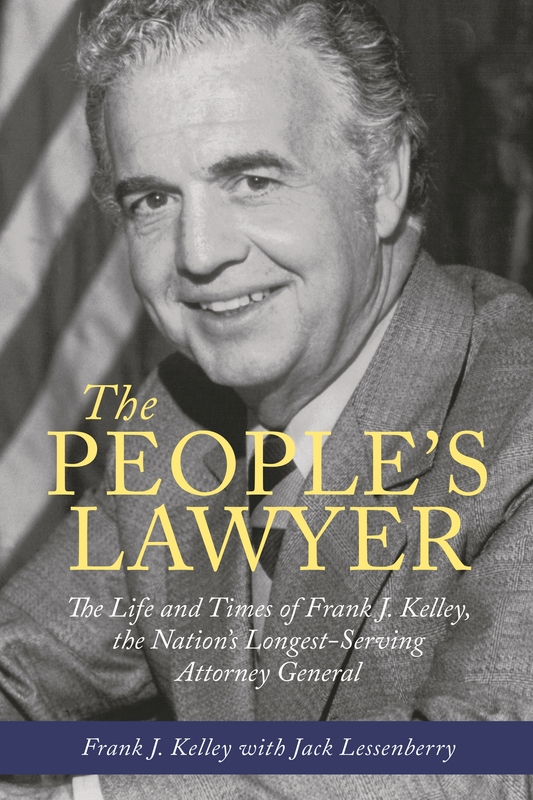 "The People’s Lawyer" chronicles Kelley’s early life and professional career, beginning with his days as a crusading lawyer in Michigan, and snakes through his accomplishments in civil rights and equal representation. In the introduction to the book, Lessenberry talks about why he believes Kelley is so beloved by those who followed his career. "I also knew he was candid, honest, and that while in charge of the legal affairs of the state of Michigan there was never a whiff of scandal or corruption," Lessenberry says. "And I knew that he was trusted by the voters in a way that would seem almost unimaginable today." Lessenberry says Kelley’s good standing with Michigan voters was also owed to his record of pushing for social change and taking on cases his predecessors wouldn’t. "He populated his army of the people’s lawyers with competent African-Americans and women before that was the norm," Lessenberry says in the book’s introduction. "Throughout his career, he prosecuted wrongdoers who others wouldn’t take on, and defended those who most needed defending"
Kelley brushed shoulders with virtually every major player in the Michigan Democratic Party and helped launch or influence the careers of Governor Jennifer Granholm, Governor James Blanchard and U.S. Senator Carl Levin. Kelley also spent time working with both John and Bobby Kennedy, and Bill Clinton. Lessenberry says it has been a privilege to co-author "The People’s Lawyer" and that Kelley is more than deserving of all of the praise and accolades he receives. "Frank J. Kelley made a difference, in a way that I think would have made his beloved father proud. It has been an honor – and a lot of fun -- to work with him on this book." Both Kelley and Lessenberry will participate in another conversation-style presentation discussing the book and Kelley’s accomplishments in the Temple Theatre at the Historical Society of Michigan on Saturday Sept. 26.